November 2018 Porte D’Aubervilliers, Paris. 0 degrees celsius and raining/sleeting. 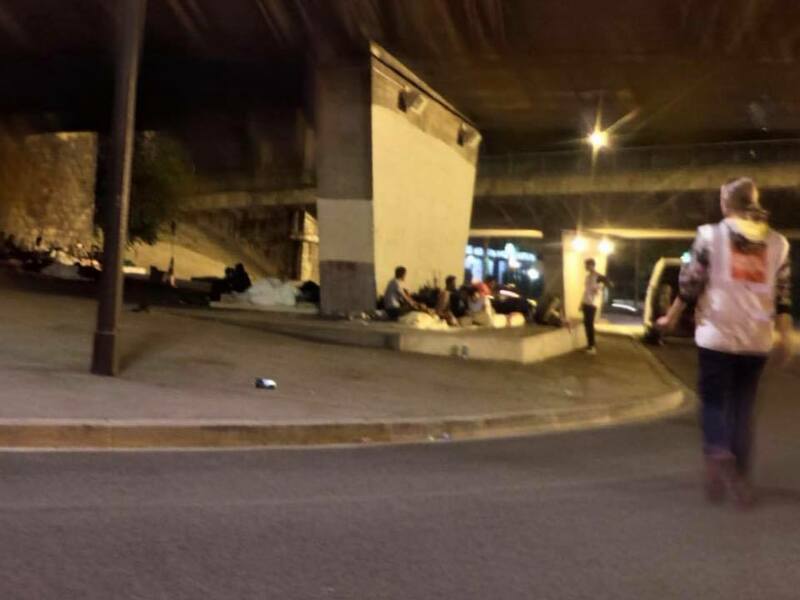 The refugees are sitting and sleeping under a raised platform next to a shop front. They are waiting to find out whether they have somewhere to stay tonight, but the reality is that most of them will remain here, some sheltered by tents, some in the open air. There are families of three generations with elderly grandparents and children as young as one year old. We met and spoke to some incredibly resilient people. These are just a few of their stories. Hamida is from Syria. She is 7 months pregnant. She is living night by night here at Porte d’Aubervilliers under a shop awning. Last night she was lucky and was allocated a hostel room. What will happen to her tonight? France is obliged to provide her with a place to give birth, but she will get no pre or post-natal care or support. An Afghan family are sleeping in two tents. They have not been given hostel accommodation tonight, as everywhere is full. Grandma and Dad try to wrestle with their three year old to put on a thick padded coat we have brought for her. Like most three year olds who don’t want to put their coat on, she is having a tantrum. She just wants to play with her slinky toy. She’s only pacified when a lady walking past gives her a bright pink coat with a furry hood – much more appealing to a three year old little girl! The family can now huddle together for warmth in the tents tonight, hopefully getting some rest. This is the reality on the streets of Paris for many of the refugees that people seem to wish did not exist. They are nobody’s responsibility and there is no solution in sight.